The 2003 summer retreat of the Society of Building Science Educators will be held this year in the heart of the Midwest, and will take advantage of access to the signature architecture of nearby Columbus, Indiana. This SBSE Retreat will mark the 20th such summer gathering of SBSE members and once again will focus on the purposeful exchange of academic and professional understandings of current issues in teaching of building science in schools of architecture and allied fields. The program coordinator is Professor Leonard Bachman from the University of Houston; site logistics and local arrangements are being coordinated by staff at the Center for Energy Research/Education/Service (CERES) at Ball State University. A special one-day excursion to the city of Columbus, Indiana has been built into this retreat enabling participants to see firsthand more than 65 executed works of signature architecture. Although participants will not formally engage in a tool-day reconnaissance event in Columbus, instrument packages will be available for instantaneous spot measurements during the scheduled facility tours. Included in this visit will be interviews with key personnel in the Columbus Architecture Center covering the history of the Cummins Engine Foundation support for the public commissioning of internationally recognized professionals in the design of these many Columbus landmarks. This opportunity will be linked to the theme of the 2003 Retreat. 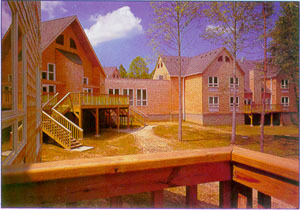 More specifically, the 2003 Retreat will focus on the relationships between the messages we deliver about buildings and the buildings from which we deliver those messages. Our conversation will revolve around the manifestations of architectural and environmental wisdom in buildings where the lessons are explicit and demonstrable. Teaching Facilities—What environmental attitudes are communicated by the places where you teach? Are there connections and rifts between the lessons and the teaching/learning environment? What do students learn about the veracity of our lessons from these places? Greening the Campus—At the village scale, how are campuses acting to form patches of green infrastructure in the overall network of cities? Typology for Environmental Study Centers—How does “design for design” in the mode of environmental design for environmental centers translate into architecture as pedagogy? Case Studies in Architecture as Pedagogy—What exemplar works can we refer to when examining buildings and the pedagogical elements of their design? Roundtable Discussions—Suggest a personal “hot topic” to gather perspectives from your SBSE colleagues in an informal setting.